HOW NEW YORK GETS ITS’ WATER | "Global Possibilities"
Revelations about tainted water have sparked worry across the country. The New York Times decided to look at how the nation’s largest municipal water supplier delivers what has been called the champagne of drinking water to 9.5 million people. 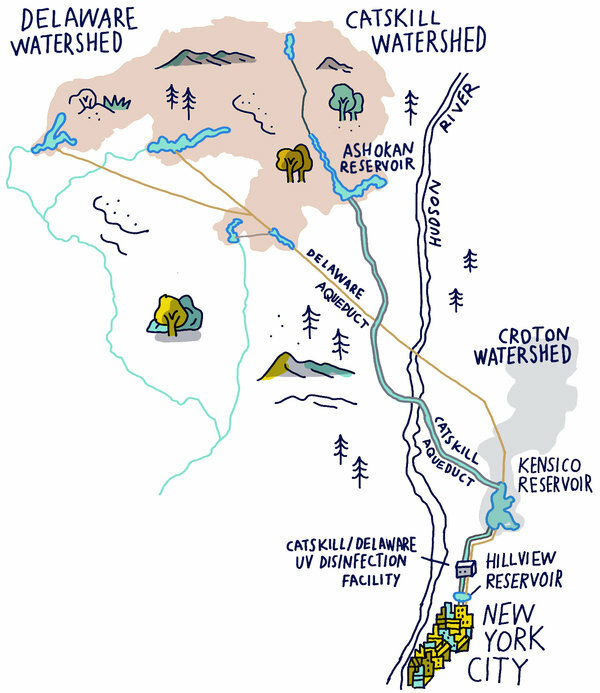 The Catskill/Delaware watershed, which extends 125 miles northwest of the city, provides more than 90 percent of the city’s supply. The rest comes from the Croton watershed. Safeguarding the city’s water begins with protecting land that surrounds the streams, rivers, lakes and reservoirs. The Catskill/Delaware watershed encompasses more than a million acres. The city, state and local governments and nonprofit land conservancies own 40 percent of the land. The rest is privately owned, but development is regulated to prevent pollutants from getting into the water supply. The city has also upgraded septic systems and wastewater treatment plants in communities around the watershed and helped build municipal salt sheds and manure sheds on dairy farms to prevent harmful runoff. “We’re treating things at the source, as opposed to at the end of the pipe,” said Paul V. Rush, deputy commissioner of the city’s Bureau of Water Supply. As a result, the federal Environmental Protection Agency exempts water originating in the Catskill/Delaware watershed from its usual filtration requirements, a dispensation the agency gives to only a few other major cities. The 92-mile-long Catskill Aqueduct, which plunges 1,100 feet underneath the Hudson River, was constructed a century ago. It can take 12 weeks to a year for water to wind its way to the city from the streams, tunnels, dams and reservoirs in the Catskills. All of it is delivered to the city by gravity alone. But the system is showing its age. The city plans to spend $3.4 billion over the next five years for hundreds of projects to fix decaying infrastructure. Among the items on the to-do list is a new tunnel to bypass a portion of the Delaware Aqueduct that has been leaking more than 18 million gallons a day for decades. When it is shut down for repairs in 2022, the city will rely on the Catskill system, as well as Croton, where a $3.2 billion filtration plant was turned on last year. 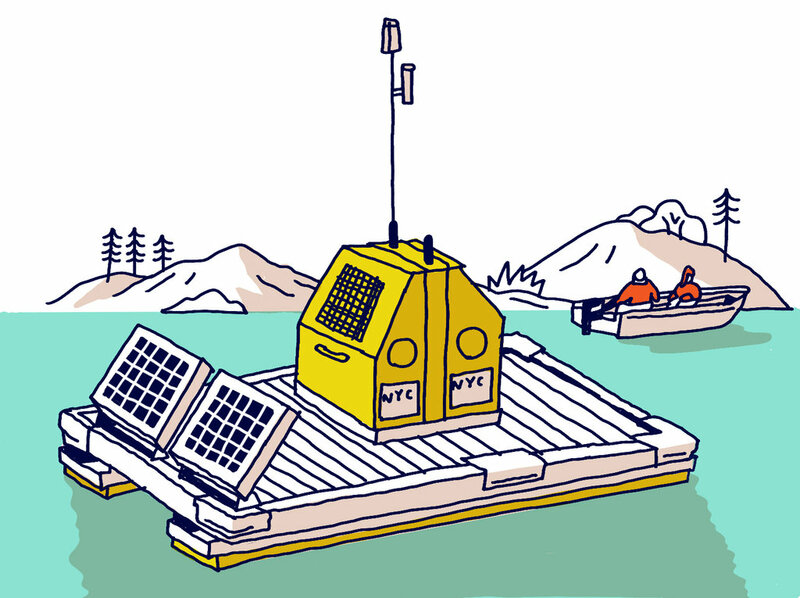 The Catskill and Delaware Aqueducts feed into the Kensico Reservoir, where robotic buoys transmit information about water quality. Chlorine, which kills bacteria, and fluoride, for dental health, are added. Field scientists are constantly monitoring temperature, pH, nutrient and microbial levels. Last year, robotic buoys recorded 1.9 million measurements, and field scientists collected 15,500 samples from reservoirs, streams and aqueducts upstate for analysis. All of the data is fed into a centralized computer system, which also takes into account advanced weather forecasting to make determinations to predict the quality and quantity of water that day — and even six months into the future — at each reservoir. One issue of concern to water experts is turbidity, or cloudiness of the water. Heavy rain and high winds can sweep fine particles of clay and silt into the system that can inhibit treatment of the water. Climate change is a major factor, too. Fluctuating precipitation patterns, forest health and water temperature can drastically affect the quality of the water and how much of it is available. Over a billion gallons of water a day pass through an ultraviolet disinfection facility in Westchester County, the world’s largest. The city’s water is treated with chlorine, but the chemical can create harmful byproducts when mixed with organic compounds. In the 1990s, ultraviolet radiation was identified as a safe and effective supplementary treatment. But for it to be evenly applied, the water must be moving at constant speed. The $1.54 billion plant uses a system of pipes to slow the water before it passes through one of 56 large containers that hold ultraviolet lights encased in quartz tubes that zap stomach-ravaging micro-organisms. The Hillview Reservoir is the last stop before the city’s water mains. Think of it as a 900-million-gallon bathtub, with enough water to supply the city for one day. Before the water is sent on to the city, chlorine, phosphoric acid and sodium hydroxide are added to disinfect it and raise the pH levels to prevent pipes from corroding and releasing harmful metals, like lead. Three main water tunnels then act like drains and whoosh water downhill. The force of the water coming through the tunnels creates enough pressure to send it up to the sixth floor of most buildings. The construction of the third tunnel, one of the largest capital projects in the city’s history, is being completed in phases. 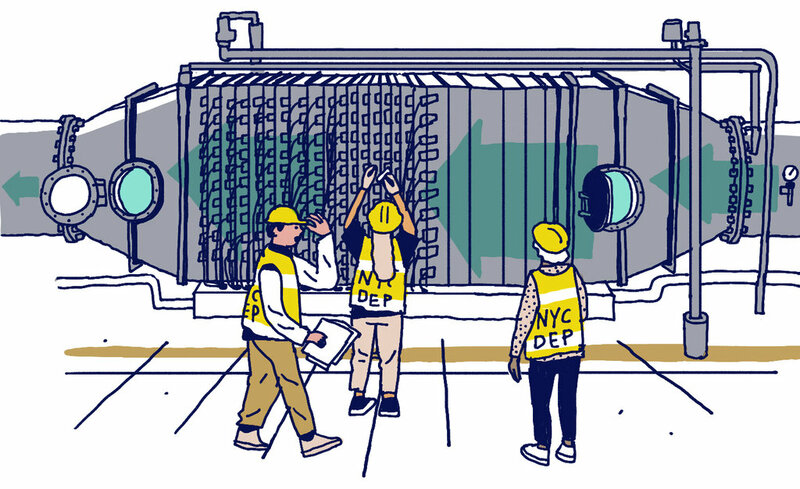 By the 2020s, the city says, the tunnel will carry water to all five boroughs — and allow much-needed inspections on tunnels one and two, which have been in continuous use since they were built in 1917 and 1936, respectively. There most likely is at least one water main underneath every street in the city. Virtually every building in the city is then connected to the municipal system through smaller pipes called service lines. 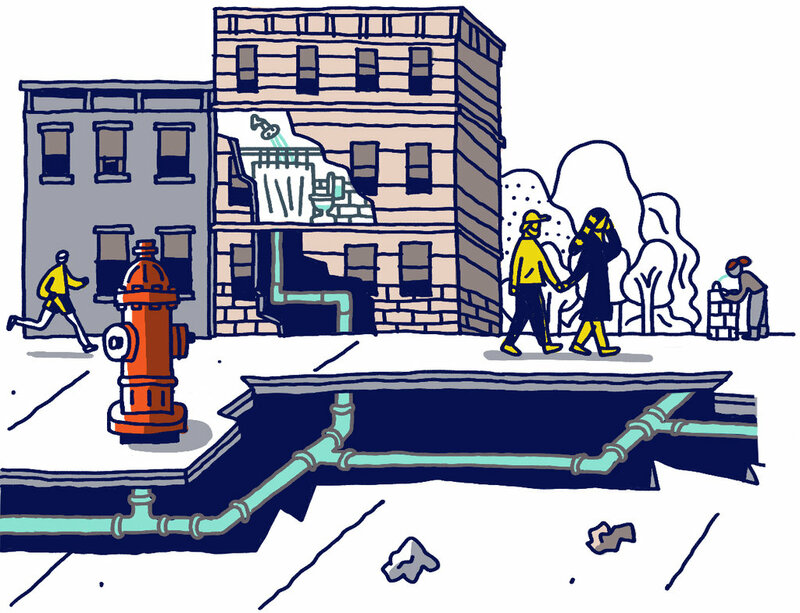 The city’s water main system is a 6,800-mile-long network of pipes. Some are large enough for a man to stand inside; almost all are made of iron and steel. Last year the city spent more than $140 million, paid for by water and sewer fees, to operate the system. The city regularly tests for contaminants, including lead, in its water mains. But there are at least 836,000 service lines, and the city estimates that 45,000 of them are made of lead. Other service lines may have pipes joined with lead soldering. Older buildings, especially, may also have plumbing or brass fixtures that contain lead. According to the city’s Department of Environmental Protection, all known lead service lines to city-owned properties — including schools, libraries and parks — were replaced from 2008 to 2010. But the city is working to identify and replace any that remain. There are about 1,000 water sampling stations throughout the city. Every day, field scientists visit 50 to check temperature, chlorine and pH levels, as well as the levels of certain chemicals that prevent pipe corrosion. Scientists collected 31,700 water samples in the city last year. More than 383,000 tests were performed on them, either at the sampling stations or at a laboratory in Queens. Scientists looked for E. coli, which could indicate sewage contamination; Cryptosporidium and giardia, common culprits of stomach illnesses; and other bacteria. They also checked for toxic metals like lead, organic contaminants and unregulated chemicals like perfluorooctanoic acid, or PFOA, a toxic chemical associated with the making of Teflon. According to the city’s annual water quality report for 2015, New York complied with all state and federal chemical limits. The results of a federally mandated water testing program for families living in homes at risk for lead contamination raised concerns among some environmental advocates. Of the 350 samples collected in 2015, 6.6 percent exceeded the federal standard of 15 parts per billion. If more than 10 percent of samples exceed this standard, water systems must take steps to reduce lead levels. But without more testing, it is impossible to know just how many households in the city actually have potentially harmful lead levels. What should I do if I’m worried about lead in my water? The EPA offers some guidance on how and when to obtain an in-home testing kit through your local water supplier. In New York City, residents can obtain one at no cost through 311. For more information, visit www.epa.gov/safewater/lead, or call the Safe Drinking Water Hotline at 1-800-426-4791. How is drinking water regulated? The federal Environmental Protection Agency sets limits for drinking water on more than 90 contaminants. Each state is responsible for making sure that public water systems meet these standards and may add additional criteria. But there are tens of thousands of industrial chemicals that have never been tested for safety. And new ones are constantly being introduced. The regulatory process is long. Periodically, the Environmental Protection Agency adds chemicals to a watchlist of unregulated contaminants that are potentially harmful. Researchers work their way down the list to determine whether the chemicals pose a risk and at what levels, and the feasibility of regulating them. Often, data on occurrences and health effects just isn’t available. The state’s Department of Health, which applies federal standards and sets its own, has been criticized for failing to devote sufficient resources to the issue. Most recently, it came under scrutiny for what residents in upstate Hoosick Falls said was a delayed response in alerting them about elevated levels of perfluorooctanoic acid, an unregulated chemical used to make Teflon products, in their water. 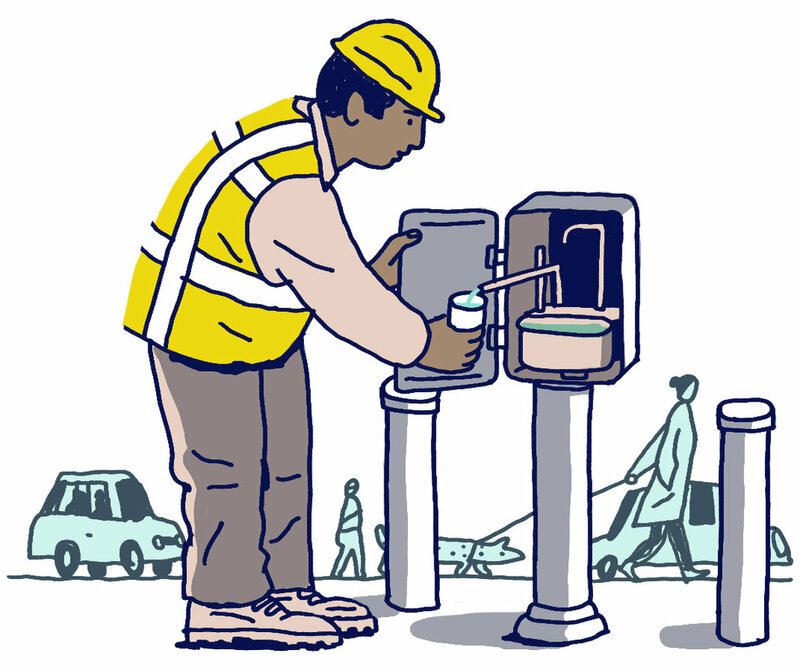 What makes New York City tap water taste so good? Thanks in part to the geology of the Catskill Mountains, which have very little limestone rock, the city’s water contains low levels of bitter-tasting calcium. As a result, New York has delicious bagels and pizza crust. But only a fraction of the city’s water is actually consumed. Most of it ends up in washing machines, dishwashers and fire hydrants. Water usage has actually decreased more than 30 percent since the 1980s. Modern toilets, faucets and showerheads use less water. The city has also hunted down and fixed leaks in water mains.